MichiganHauntedHouses.com recently sat down with Tiffany Waddell of Kerridge's Haunted Pines, to discuss what's new at Kerridge's Haunted Pines for the 2018 Halloween Season! Located in Naubinway, this not-for-profit haunt offers a 1/4 mile walk-through featuring exhibits and live scares throughout. Be sure to check out the terror being stirred up this year! What's new at Kerridge's Haunted Pines for 2018? Do you have any new rides, attractions, or special features that Haunt Seekers should know about? Every year we do new exhibits and live scares. We use new props continually and usually never use the exact same scene in the exact same place. I am excited about everything for the trail (that's what we call it) this year! I love making stuff and scaring people and can't wait until October 20th! What differentiates Kerridge's Haunted Pines from other local haunts in Michigan? We are located in the UP, and are family owned and operated. My entire family (Grandma, Grandpa, Aunts, cousins, children, sisters and parents) all help with the trail. We all get together and put everything together on the Friday and Saturday before the big night, and then we scare for one night and one only, and take everything down and put it away on Sunday. It's a lot of work for one night, but so worth it! How long has Kerridge's Haunted Pines been in business? Can you tell us a bit more about Kerridge's Haunted Pines's history? This is our 9th year haunting! Every year I think we get a little bigger and a little better. At first we used a lot of batteries and solar lights to power our equipment, and we have now started using a couple generators to power some stuff and have added rope lights to our pathways through the pines. What's your favorite experience since opening Kerridge's Haunted Pines? Every year, the first air horn blows, that signals the first customers of the year, is a favorite experience! And then every minute of the trail thereafter... I love hearing the screams and then everyone telling all their scare stories at the end of the night around the fire! 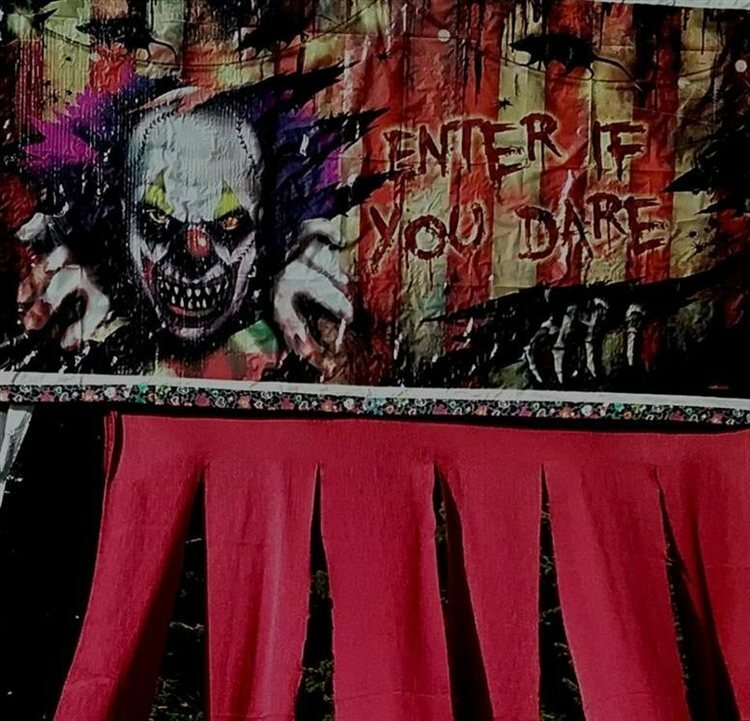 How long is a typical haunt experience at Kerridge's Haunted Pines from start to finish? It really depends on how fast you walk... we are just over a 1/4 mile long.... Some groups go really slow and look at everything and some go fast through because they are scared. On a scale from 1 to 10, how scary would you say Kerridge's Haunted Pines is? Why? I would give it a 7 or maybe an 8 I guess. We are in the woods, in the dark at night, with no guide... but we don't touch people, and our exhibits and scares are spaced throughout the trail, so some places are scarier than others. Does Kerridge's Haunted Pines's property have any real haunted history? Do you have a spooky encounter you'd like to share? Unfortunately, no to either... but that would be cool. My parents went to a corn maze and loved it. They wanted to do their own corn maze, but that's kinda hard to do without corn. So, they made do with what they did have.... mazes of pine trees, and Kerridge's Haunted Pines was born! I love to do this every year with my family, and scaring people is of course, my favorite part of the business. How has new technology (i.e. animatronics, special props, etc) helped you to enhance Kerridge's Haunted Pines? We are not very high tech.... I think that's one of the things that makes us different from other haunts. We make pretty much everything that we use, and have just now in the last couple years started using power. Can Kerridge's Haunted Pines accommodate large groups? How many people can experience Kerridge's Haunted Pines together as a group? I believe we could accommodate large groups.... so far, we've not had to, so we have no maximum for groups. It would probably be more fun and people would get more out of it being in smaller groups, instead of large ones though. Does Kerridge's Haunted Pines offer any special deals, discounts, or coupons? We are by donation only, unless you would like to go through the trail again and then a $2 ticket must be purchased for re-entry. All donations go towards future trail props and needs. Anything else you'd like to let us know about Kerridge's Haunted Pines? Just would like to say thank you for posting us!